قبادی, محمد حسین, رسولی­ فرح, محمدرضا. (1391). مطالعه خصوصیات زمین‌شناختی مهندسی گرانیت‌های بروجرد. نشریه انجمن زمین شناسی مهندسی ایران, 5(شماره 1 و 2), 1-16. محمد حسین قبادی; محمدرضا رسولی­ فرح. "مطالعه خصوصیات زمین‌شناختی مهندسی گرانیت‌های بروجرد". نشریه انجمن زمین شناسی مهندسی ایران, 5, شماره 1 و 2, 1391, 1-16. قبادی, محمد حسین, رسولی­ فرح, محمدرضا. (1391). 'مطالعه خصوصیات زمین‌شناختی مهندسی گرانیت‌های بروجرد', نشریه انجمن زمین شناسی مهندسی ایران, 5(شماره 1 و 2), pp. 1-16. قبادی, محمد حسین, رسولی­ فرح, محمدرضا. مطالعه خصوصیات زمین‌شناختی مهندسی گرانیت‌های بروجرد. نشریه انجمن زمین شناسی مهندسی ایران, 1391; 5(شماره 1 و 2): 1-16. فراوانی سنگ­های گرانیتی و استفاده زیاد از آنها به عنوان سنگ نما و مالون، شناخت ویژگی­های زمین‌شناختی مهندسی این سنگ­ها را ضروری ساخته است. شناخت تنوع سنگ‌شناختی و ویژگی‌های فیزیکی و مکانیکی این سنگ‌ها از این جهت که ساختگاه برخی سدها (سدهای شهریار و طرق و پی سازه‌های مسکونی و تجاری را در بعضی از مراکز جمعیتی کشور تشکیل می­دهند نیز قابل اهمیت می­باشد. در این پژوهش بر اساس بازدیدهای صحرایی در شمال و شمال‌خاوری بروجرد، رخنمون­های مناسب توده گرانیتی بروجرد شناسایی شد و نمونه‌برداری از آن ها انجام شد. با مطالعه مقاطع نازک از نمونه­های تهیه شده از 7 معدن، خصوصیات کانی‌شناختی، بافت و نام زمین‌شناختی گرانیت­­ها تعیین گردید. با توجه به نتایج حاصله توده گرانیتی بروجرد متشکل از گرانودیوریت، مونزوگرانیت، گرانیت سفید و تونالیت می‌باشد. مطالعات سنگ‌شناختی وجود شکستگی­های میکروسکوپی ناشی از تکتونیک فعال منطقه را تایید می­کند. در این پژوهش خصوصیات فیزیکی و مکانیکی 224 نمونه سنگ گرانیت با انجام آزمون‌های استاندارد تعیین شده است. مطابق با رده‌بندی آنون (Anon) وزن واحد حجم گرانیت­های بروجرد متوسط تا زیاد می‌باشد. میزان جذب آب در اکثر نمونه‌ها کمتر از 1 درصد است. حداکثر سختی آنها 53 و حداقل 39 می‌باشد. شاخص دوام این سنگ‌ها بعد از 15 سیکل حداقل 34/96 و حداکثر19/99 درصد بوده است. بیشترین و کمترین مقدار مقاومت کششی در حالت خشک 6/3 و 12 مگاپاسکال است. بیشترین مقدار مقاومت فشاری سنگ­ها 123 و کمترین مقدار 58 مگاپاسکال می­باشد. بر اساس مقاومت فشاری تک‌محوری و نسبت مدولی، گرانیت­های بروجرد طبق رده‌بندی مهندسی سنگ بکر در رده CL و BL قرار می­گیرند. روابط به دست آمده بین خصوصیات سنگ‌شناختی، فیزیکی و مکانیکی با ضریب همبستگی مناسب می­تواند برای انجام مطالعات زمین‌شناختی مهندسی پروژه‌های عمرانی و معدنی در ناحیه فوق مورد استفاده قرار بگیرد. The abundance of granitic rocks and their frequent use as ornamental stones and Malones has made the recognition of their engineering geological properties important. Recognizing the diverse lithological, physical and mechanical properties of these rocks is also of importance because they are used in the construction of dams, and foundations of residential and commercial structures in different regions of the country. In this research, based on field studies in the north and north- east Boroujerd, appropriate Boroujerd granite mass crops were identified and sampled. Through studying thin sections taken from 7 mines the textual, mineralogical and geological characteristics of granites were determined. According to the results, Boroujerd granite masses composed of granodiorite, monzogranite, white granite and tonalite. Also petrological studies show the microscopic fractures caused by the active tectonic zone. In this study, using standard tests, the physical and mechanical properties of 224 samples of granite were determined. According to Anon's classification the density of Boroujerd granites are medium to high. Water absorption in most samples is less than 1 percent. Their maximum hardness is 53 and at least 39. The highest and lowest tensile strength when dry is 3.6 and 12 MPa. Based on maximum uniaxial compressive strength and elasticity ratio, and according to the engineering classification of intact rocks Boroujerd granites are classified in the categories of CL and BL. The obtained relations between lithological, physical and mechanincal properties and proper correlation coefficient can be used in geological studies and civil engineering projects of the area. احمدی خلجی، ا.، 1386. پترولوژی و ژئوشیمی توده‌های گرانودیوریتی بروجرد(غرب ایران)، مجله علوم دانشگاه تهران، جلد 33، شماره1، صفحه 1-14. سازمان زمین‌شناختی کشور، 70 13. نقشه زمین‌شناختی 1:100000 بروجرد. رسولی فرح، م.، 1389. مطالعه خصوصیات زمین‌شناسی مهندسی گرانیت‌های شمال و شمال خاوری بروجرد. پایان‌نامه کارشناسی ارشد، دانشکده علوم، دانشگاه بوعلی سینا. Akesson, U., Lindqvist, J.E., Go¨ransson, M., Stigh, J. 2001. Relationship between texture and mechanical properties of granites, central Sweden, by use of image-analysing technique. Bulletin of Engineering Geology and the Environment, 60: 277–284. American Society for Testing Materials, 1998. Annual Book of ASTM Standard, vol.09.08 and 04.04. Angeli M., Hebert, R., Menendez, B., David, C., Bigas, J.P., 2010. Influence of temperature and salt concentration on the salt weathering of a sedimentary stone with sodium sulphate. Engineering Geology, 115(3-4): 193–199. Anon, 1979. Classficatoin of rocks and soils for engineering geological mapping. part 1- Rocks and soils material. Bulltin of Engineering Geology and the Environment, 19: 71-364. Ayday, C.G., Oktan, R.M. 1992. Correlations between L and N-type Schmidt hammer rebound values obtained during field-testing. In: Hudson J.A. (Ed. ), International ISRM Symposium on Rock Characterization. Chester. pp. 47–50. I˙rfan, T.Y., 1996. Mineralogy, fabric properties and classification of weathered granites in Hong Kong. 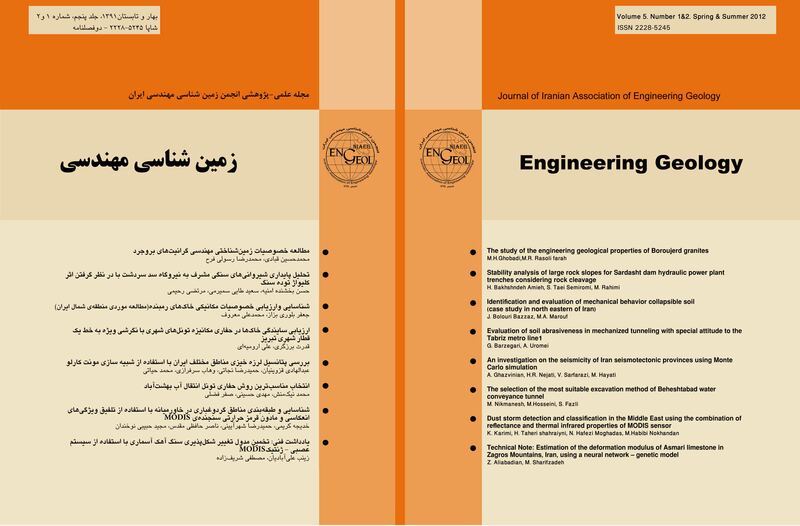 Quaterly Journal of Engineering Geology and Hydrogeology, 29: 5–35. ISRM, 1981b. Rock Characterization Testing and Monitoring, Suggested Method. Brown E.T. (Ed. ), Oxford: Pergamon Press., London, 221p. Katz, O., Reches, Z., Roegiers, J., 2000. Evaluation of mechanical rock properties using a Schmidt hammer. International Journal of Rock Mechanics and Mining Sciences, 37: 723–728. Merriam, R., Rieke, H.H., Kim, Y.C., 1970. Tensile strength related to mineralogy and texture of some granitic rocks. Engineering Geology, 4: 155–160. Onodera, T.F., Asoka Kumara, H.M., 1980. Relation between texture and mechanical properties of crystalline rocks. Bulletin of Engineering Geology and the Environment, 22: 173–177. Ra¨isa¨nen, M., 2004. Relationships between texture and mechanical properties of hybrid rocks from the Jaala–Iitti complex, southeastern Finland. Bulletin of Engineering Geology and the Environment, 74: 197–211. Sachpazis, C.I., 1990. Correlating Schmidt hardness with compressive strength and Young's modulus of carbonate rocks. Bulletin of the International Association of Engineering Geology, 42: 75–83. Sousa, L.M.O., 2007. Granite fracture index to check suitability of granite outcrops for quarrying. Engineering Geology, 92: 146–159. Zhang L, 2005. Engineering Properties of Rocks, Vol. 4., 1-290. Elsevier Publ., Amsterdam.